You, too, may have been inspired that day, 20 January 1961, when John F. Kennedy spoke, “Ask not what your country can do for you — ask what you can do for your country,” Stephen and Barbara Arnest were. The Arnests were inspired by Kennedy's inaugural words as well as his Peace Corps idea, so much so that they planned to volunteer. But, life — and a bloody coup in Nigeria — got in the way. So, the volunteering idea went into a hiatus of sorts, patiently waiting for the right time to emerge. And, it did emerge, some 40 years, two careers, a family, and two entire lifetimes later. After retiring from Ford Motor Co. (Steve) and National City Bank (Barb) the Arnests packed their allotted 80 lbs each of personal belongings and boarded a plane bound for Papua New Guinea. Steve and Barb knew they had something to give to others in need, no matter where the Peace Corps sent them. They had years of experience for sure, yet, more importantly, anyone who met them instantly knew that they shared sincere compassion and commitment for helping others in need. Today, you will find them even more knowledgeable, compassionate and committed. Steve graduated from Michigan State University with a degree in social science and a master’s degree in history from Michigan State University. 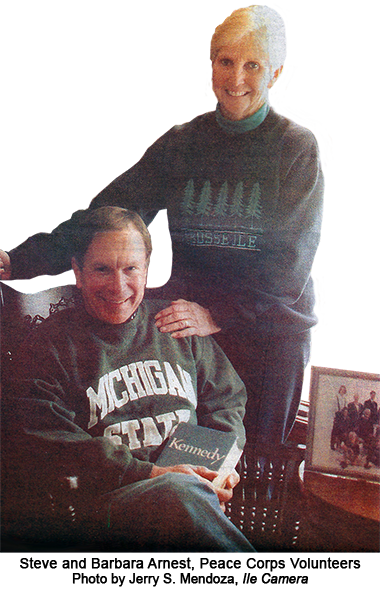 He taught at East Lansing Junior High School (1960 – 1965) and later became an assistant professor at the University of New York at Brockport, near Rochester, NY. Barbara graduated from Wyandotte (MI) Roosevelt High School in 1956 and attended Eastern Michigan College (a.k.a. University) in Ypsilanti, MI. In 1958, she and Steve were married. Prior to her Peace Corps experience, Barbara retired from the First of America Bank after more than 20 years of banking experience. As their family grew, Steve moved too. He joined the automotive industry by taking a position with Chrysler Corp. in quality control. Later, he joined Ford Motor Co. at its plant warehouse and parts distribution center in Woodhaven, MI. Some 21 years with Ford passed and he decided to retire – but not from challenges. Steve had more on his plate to accomplish, among them were: taking care of his parents, who were in their declining years; work at a golf course; run the Boston Marathon (achieved in 1993); play in a band (He accomplished this objective by playing clarinet with the Downriver Community Band for 12 years. ); and to serve in the Peace Corps. After making their way to Papua New Guinea, they attended a 10-week training program in order to familiarize themselves with the language, customs and needs of the people of Goroko, which is located in the highlands, several miles from Port Moresby. After the training period they were assigned to the Institute of Medical Research in Goroka teaching HIV/AIDS education. Also, Barb and Steve used their experiences as a learning tool for students back home through the Peace Corps’ World Wise School Program. Barb wrote to children from Monroe Elementary School in Wyandotte (MI) and Steve corresponded with high school students in Huntington Woods, MI. Steve rejoined the Peace Corps in 2005 assisting the victims of the Katrina Hurricane in New Orleans. His Peace Corps efforts and those of his wife Barbara earned Steve the honor of being elected to the distinguished graduate hall of fame at Wyandotte (MI) Roosevelt High School, his alma mater. Since that time, Barbara and Steve have established a Peace Corps Scholarship at Roosevelt High School given annually to a student that continually displays the true spirit of volunteerism. 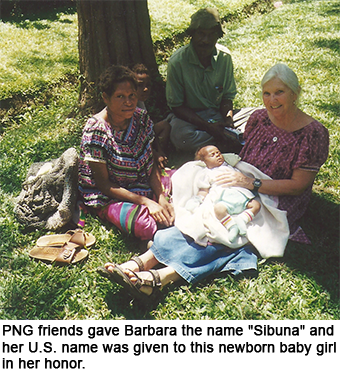 Please read: Letters Home, Steve & Barb wrote about their Papua New Guinea, Peace Corps experience: Foreign Correspondence; Greetings from PNG! ; PNG Observations & Facts; and, Helping Hurricane Victims — Survivors Hold Onto Faith. President John F. Kennedy's inaugural address. For more information, visit the Peace Corps website.